The Volkswagen Jetta (A5) Service Manual 2005-2010 is a definitive reference source of technical automotive repair and maintenance information for Volkswagen Jetta models built on the A5 platform. Service to Volkswagen owners is of top priority to Volkswagen and has always included the continuing development and introduction of new and expanded services. Whether you're a professional or a do-it-yourself Volkswagen owner, this manual will help you understand, care for and repair your Volkswagen. The do-it-yourself Volkswagen owner will find this manual indispensable as a source of detailed maintenance and repair information. Even if you have no intention of working on your vehicle, you will find that reading and owning this manual makes it possible to discuss repairs more intelligently with a professional technician. Engines: 1.9L TDI PD diesel (engine code: BRM), 2.0L TDI common rail (engine code: CBEA, CJAA), 2.0L FSI turbo gasoline (engine code: BPY), 2.0L TSI turbo gasoline (engine code: CBFA, CCTA) & 2.5L gasoline (engine code: BGP, BGQ, CBTA, CBUA). Transmissions 0A4 5-speed manual, 02Q 6-speed manual, 09G 6-speed automatic & 02E 6-speed DSG. 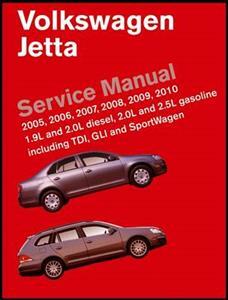 Covers Jetta models 2005-2010 based on the A5 platform. Maintenance procedures from oil changes to belt replacement. Engine and cylinder head service, including timing belt replacement. Removal and installation of Motronic (gasoline) and diesel fuel injection system components, including Pumpe DÂ³se (PD) and common rail diesel. Emission control tests, repairs and adjustments, including exhaust gas recirculation and secondary air injection system. Drivetrain maintenance, troubleshooting, adjustment and repair, including clutch, gearshift linkage, and drive axles. Suspension component replacement including front struts, rear shocks, coil springs, wheel bearings and wheels. Heating and air-conditioning repair, including A/C component replacement for Climatronic and Climatic systems. Body adjustment and repairs including front and rear doors, fenders, front radiator support and sunroof. Wiring schematics with fuse/relay locations including an easy-to- use illustrated component locator section. Volkswagen OBD II diagnostic trouble codes, SAE-defined OBD II P-codes, as well as basic scan tool operation. Comprehensive Volkswagen factory tolerances, wear limits, adjustments, and tightening torques. This definitive reference source of technical automotive repair & maintenance information for Volkswagen Jetta models built on the A5 platform from 2005-2010. With engines,1.9L & 2.0L diesel, 2.0L & 2.5L petrol including TDI, GLI & SportWagen.